Fort Lytton is Queensland’s foremost military exhibit, with extensive historic fortifications, Queensland’s largest military museum and regular military re-enactments. Admission, guided tours and parking are all free 10am-4pm on Sundays, most public holidays and special occasions. It’s a great day out for everyone, from families to serious historians. A nice introduction to the subject. Loads of interesting stuff about Jalan Kayu and RAF Seletar. A 6-Inch Coast Defence Battery in Northern Ireland. A site about research on events and personal stories about the fall of Singapore on 15th February 1942. The main thrust of the website is the evacuations of civilians and military personnel from Keppel Harbour. A Singapore Urban Exploration Group which does not remove artefacts. As the saying goes, “Take nothing but photographs, leave nothing but footprints. Get Your history fix here. Have you been an Australian Gunner? If so, this is the website for you. The Pengerang 6-Inch Coast Battery in Johor. 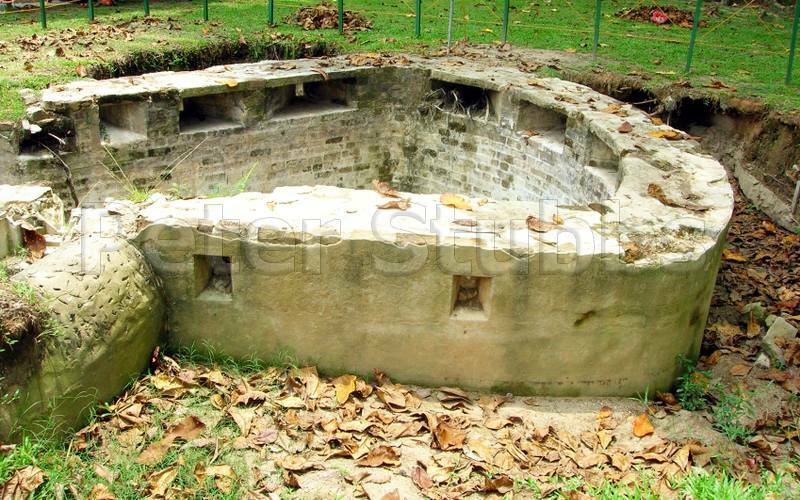 This battery was part of the defences for the Singapore Naval Base before and during WWII. The Wanstone Battery, only other British 15-Inch Coast Artillery Battery. This was on the south coast of England near Dover. The only coast battery in England to open fire in anger during the First World War. The only true fort built in Singapore. See the work carried out by local archaeologists. A 6 Inch Coast Artillery Battery in Vancouver, Canada. Where Fort Siloso is - and a lot of other places of interest. A series of Murals painted by Bombardier Stanley Warren, RA, when he was a POW at Changi during 1942/43. The price of War as seen in the 4,700 plus burials from WW2. The Military Cemetery - Military and their family Graves. The price of War in Peace: Malayan Emergency and 'Confrontation'. The Home for former Air Despatch Personnel of the British Army. The Museum of the Royal Regiment of Artillery. The Far East Prisoner of War Community. Many still suffer. Still the best by far. Under-equipped, far smaller than it should be, and well over stretched. A smell beneath politician’ noses. A living history group who portray predominantly a re-creation of the ‘Gunners’, both male and female from the Second World War. A first class street map for Singapore. Another country with a lot of coast artillery heritage.